On Friday, almost 600 people flocked into the historic Fairlie-Poplar district in downtown Atlanta. They weren't coming for a sporting event or a music festival or a big-name singer (all pretty standard reasons Atlantans and visitors alike brave downtown traffic). Instead, they were venturing into the world of tricky one-way streets and oddly-priced parking decks for one reason: To come together. 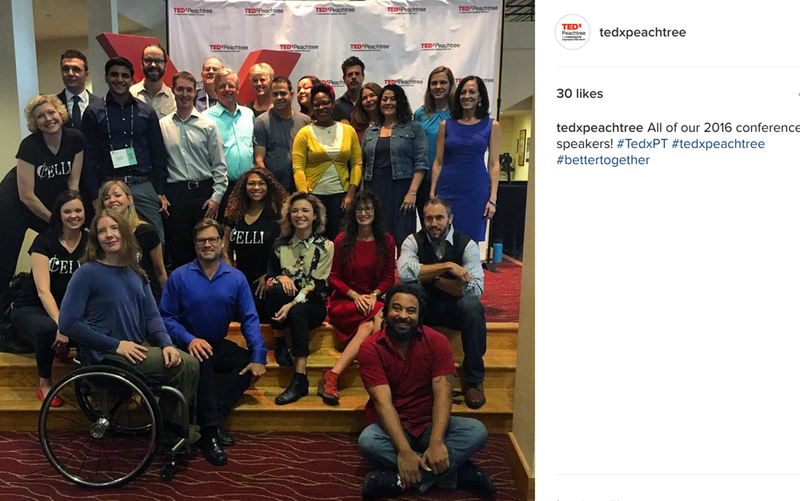 That was the theme of the 2016 TEDxPeachtree conference: Together. Held at the Rialto Center for the Arts at Georgia State University, the annual event drew international attendees and widespread watch parties for a day of embracing new and different ideas. The four sessions were broken into segments that approached the theme in various ways, with "X-Zone" activities crafted to bring attendees together outside of the presentations and an ATDC Innovation Studio in the lower level. "We humans yearn for social interaction. ... we at TEDxPeachtree started 2016 with a strong sense of responsibility to curate ideas that will bring us together. In these divisive times, ideas are more important than ever," said TEDxPeachtree licensee Jacqui Chew. "So we will hear a wide variety of ideas. Some address the very issues that drive communities apart; others offer a lens into a whole new world and new perspective." The logistics of TEDxPeachtree itself are a masterpiece of different people coming together. The group, one of the pioneer TEDx groups in the world, is a Georgia non-profit and works with an all-volunteer crew. The team is made up of people of all backgrounds who just want to participate, from teens to parents with day jobs to experienced industry professionals. There are no paid, full-time staff members. And even the emcee donates her time! This year, for the second time in a row, the show was hosted by local media personality and radio host Dana Barrett. 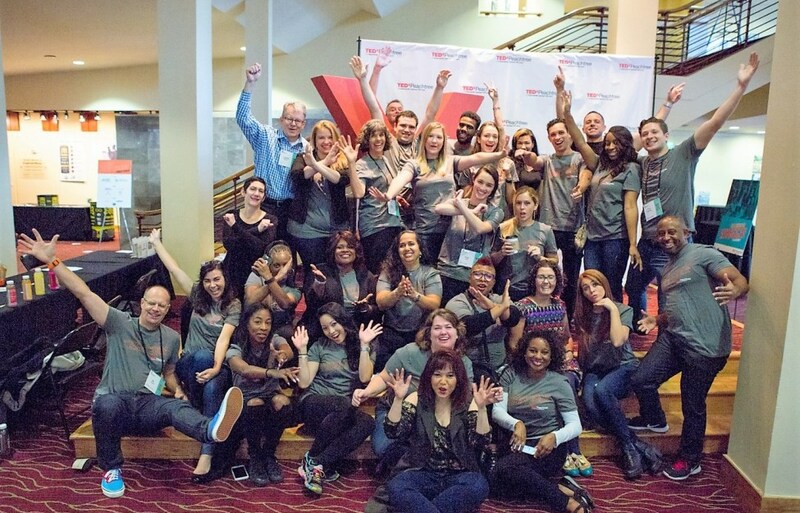 If it sounds right up your alley, check out the TEDxPeachtree Web site for volunteer opportunities with next year's event! If you missed TEDxPeachtree 2016 and couldn't catch it on the livestream, not to worry: We live-tweeted and covered it, um, extensively on social media channels, plus video of approved speakers will soon go up on the TEDx global YouTube channel. For now, let's do a quick recap of each session's highlights! The first group of speakers have spent their time examining what influences our behavior and our personalities. What drives us apart, and what brings us together, what makes us human, and why we do what we do. Emily Bianchi talked about her team's research into how money affects social ties. Turns out, money shapes how we affiliate and with whom. While most Americans choose family over friends to ask for instrumental support, high earners spent fewer evenings with family and more time with friends. Steven M. Platek wanted to tell us "why what we know about psychology is wrong." It's no longer just reclining couches and recounting dreams, and being born as a blank slate is outdated. There are new perspectives and approaches in neuroscience, not to mention a new way of thinking about psychology called "The Gut Check System." Barbara O. Rothbaum's team is exploring the use of virtual reality in treating phobias & PTSD. What mental barriers could be crossed if behavior can be influenced by experiences in the virtual world? If, as she said, "there’s no way to the other side of pain except through it,” then exposure therapy via VR brings a whole new level of accessibility to facing your fears. A video of a global community TED Talk by James Veitch touched on the agony of trying to unsubscribe from spam emails, and how you should face every adverse situation with a sense of humor. “Change can be frightening, and the temptation is often to resist it. But change almost always provides opportunities -- to learn new things and to rethink tired processes.” Klaus Schwab, founder of the World Economic Forum. The second group of speakers will challenge what we think we know. So reset ... rethink. A video of a TEDx global community Flash Opera event from TEDxRiodelaplata. This video was shown in 2013 at TEDxRiodelaplata and has since been viewed 1.5 million times and counting. Full Radius Dance, one of the top physically integrated modern dance companies in the nation, performed a breathtaking piece that brought the audience to their feet for the first standing ovation of the day. Moe Carrick struck a chord with the audience when she talked about "I hate waking up on Monday mornings" in her "workplaces fit for humans" talk. Her research has shown that what really matters to people about where they work isn't ping-pong tables and nap rooms, but feeling connected, and being seen as worthy at work. When we believe in our gut that what we do matters, we'll do anything. A video of a global community TED Talk by Achenyo Idachaba on "How I turned a deadly plant into a thriving business." Fascinating commentary on turning seaweed into home decor. Anneliese Singh encouraged everyone to learn a new perspective on gender. She transfixed the crowd with discussions on transgender resilience, despite the extremely high attempted suicide rate of trans people, and challenged the audience to be the change themselves. It's time to expand our view of gender and resist stereotypes, and Singh says everyone can help. We rounded out the session with a Q&A with TED Resident Sheryl Winarick, who spoke with Jacqui Chew about the TED Residency program, how it incubates ideas and the project that came out of her time in the program Hope Domino. Applications can be submitted here. Essentially, when any two or more entities interact, you have a system. This third group of speakers delved into interconnectivity and the intricate and sometimes unexpected connections between two or more parts. Secondhand Swagger opened the third session, taking the stage with, well, swagger. The audience rocked out to their eclectic blend of southern rock and R&B from the 60s and 70s. When they say they play "southern-fried funk," that's exactly what they mean! Eloisa Klementich's goal is to make government relevant, but it's not what you think. Her inspiring, passionate presentation talked about a new way the government could solve problems and address challenges. She said that, at its heart, being an entrepreneur is about passion, drive, seizing an opportunity, and taking strategic risks -- and she wants to know, what if government behaved in an entrepreneurial way? The audience wanted to know, too! The oceans make up 99% of the living space on earth and Christopher Clark listens to all of it. He can hear things most people don't bother to listen to, but he wants that to change. Ship's engines and other man-made noises are drowning out whale songs -- what he called "the ocean's voices," or the sound of the ocean breathing. His haunting whale song recordings mesmerized the audience, causing them to reflect on why it matters if all of our human noises are making it difficult for ocean life to hear and be heard and how it could be affecting the very organisms that are producing every other breath of oxygen humans breathe on this planet. A video of a global community TED Talk by Aomawa Shields on how we'll find life in other planets. We are wise to pay attention to light we can't see, to sounds we can't hear, to life we know is there, and on which our lives depend. Jim Beasley asks, "What do you think of when you hear Chernobyl or Fukushima, sites of the worst nuclear accidents?" If you're thinking of three-eyed creatures and a barren wasteland, you'd be wrong. Chernobyl 30 years later is more like a state park where you're the only visitor, where wildlife abounds despite the radiation and because of the lack of humans. This plethora of wildlife, especially the wolves, demonstrate that ecosystems are incredibly resilient, but that we must better understand human impact on animal species and learn how to co-exist. Life is really all about our experiences. And it is our shared experiences that bring us together. Experiences can lead to epiphanies, they can shape and inspire us, they make us hopeless or give us hope and, most importantly, then can help us understand each other better. The speakers in the final session explore experiences from a variety of angles. Playwright and poet Peter Maeck opened the last session with a powerful poetic monologue called "A finer madness," on navigating depression told using the metaphor of losing a twin. The attendees responded to his emotional outpouring, leaning forward in seats and nodding along. Brett Trapp spoke on "Finding my truth, it's a question of faith." In a speech that resonated strongly across the audience, Trapp discussed how being a gay person of faith in the American South is its own unique challenge, and how lonely it can be. But his positive energy was infectious, prompted a unique mid-session round of applause when he said, "I don’t think our religious communities have a problem with hate. I think we have a problem with love." Trapp recommends finding a crowd and speaking your hard truth until all the fear is drained out. He certainly did that, ending in a thunderous standing ovation. A video of a global community TED Talk by Chieko Asakawa on "how new technology helps blind people explore the world" inspired the audience as they watched Asakawa demonstrate her technology that helps blind people interact with, and understand visuals from, the world around them. Kathleen Baumgardner's lifelong love of community service and giving back prompted her to start the Fort Collins Giving Tree and the FoCo Cafe, a nonprofit restaurant. Hers is "a space that inspired a community," and her experiences with the visitors to the cafe, and explaining how it has helped restore dignity to the usually undervalued community members, caused many in the audience to tear up and yet another standing ovation. Dr. Heval Mohamed Kelli is a walking inspiration. He's come on a journey from Syrian refugee, to dishwasher, to now a cardiologist at Emory. He depended on acts of kindness for others, so he always has a kindness for others now. But he's not content with that -- he also pays it forward, working within the refugee community, even volunteering at a clinic in Clarkston, Ga., just a block from where he used to clean toilets. His research and published work on food deserts and health is now helping change low-income and refugee communities for the better. As a surprise tie-in, the TEDx organizers then welcomed onto the stage the mayor of Clarkston, Ted Terry, who announced a TEDxPeachtree event on December 13 to bring the local community and local refugees together. Atlanta Celli then ended the 2016 event with yet another incredible performance, leaving attendees inspired, excited and motivated as they exited to chat with one another and taste-test local food and drink vendors. And that's a wrap, from TEDxPeachtree 2016! We so appreciate our incredible speakers, volunteers, partners and vendors, and, of course, our amazing attendees -- not to mention the livestream viewers in more than 600 locations (including every East Coast state in the U.S., California, Colorado, Arizona, Nevada as well as Canada, Germany, Italy, Norway, Brazil and Greece). Thank you for joining us! Aly Merritt is a former copy editor with a residual addiction to journalism. She is currently a product manager at SalesLoft, and sporadically blogs at www.AlyintheATL.com.